Rhoda E. Rowe, nee Combs, 89, of Millstadt, Illinois, born Tuesday, February 19, 1929, in Carterville, IL, passed away Monday, January 28, 2019 at her residence in Millstadt, Illinois. 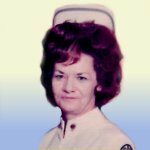 Rhoda was a retired LPN Nurse. Memorials: Memorials may be made to Family Hospice of Belleville. Visitation: Visitation from 10:00 am – 1:00 pm, Friday, February 1, 2019 at Kurrus Funeral Home in Belleville, IL. Funeral: Funeral Services will be held at 1:00 pm, Friday, February 1, 2019 at Kurrus Funeral Home, with Rev. Doug Stewart officiating. Interment will follow at Mount Hope Cemetery, Belleville, IL. My prayers are with all the family and friends at this loss. No matter how long God allows our loved one to stay it is never enough time. Parting is such a hard thing but thank God we will all be together if we put our trust in Jesus.